The VSCDA event began with a Friday testing. During the two on track sessions Vollrath reset his personal best lap times as the ArmsUp team continually improved the performance of the car with chassis adjustments and gear changes. Saturday brought qualifying and the sprint race. Vollrath's improvement continued throughout the day as each session the driver of the Stoelting backed car lowered his lap times further. Qualifying produced personal best lap of 2:36.1 around Road America which put Vollrath fifth on the grid for the sprint race. Once again Vollrath would drop his personal lap record, this time by a massive six-seconds, to come home with a fourth place finish. The result was Vollrath's first top five in the British racing green Lola. The final day of the Elkhart Lake Vintage Festival brought the feature races and another chance for Vollrath and the ArmsUp Motorsports team to improve. Once again Vollrath drove superbly in the eight-lap event. Vollrath again dropped his personal best lap time, this time by two-seconds, to a 2:28.8 on the four-mile circuit. 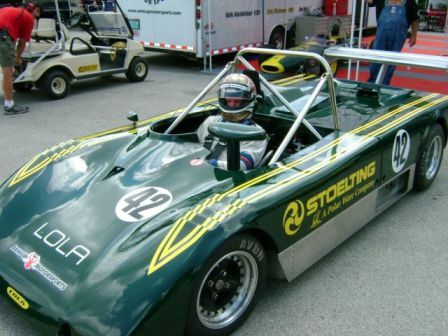 As the times continued to fall Vollrath's finishing position continued to elevate as the driver of the number 42 Lola crossed the stripe in third-place. The result marked the first podium finish for Vollrath and ArmsUp Motorsports in vintage racing competition. "What a blast this car is to drive. I get more and more comfortable with the car each time I drive it," Vollrath said after the event. "Every time out we make the car just a little bit better. Jim [Pace] and Gregg [Borland] have helped get me very comfortable and we keep going faster. ArmsUp Motorsports has done a great job restoring the car and it is just a joy to be out there driving it." ArmsUp Motorsports will now have a month long break before their next event. For the first time in three years the team will skip the SCCA National Championships instead deciding to focus on the 2009 Runoff's when they debut at Road America. The final race for the 2008 ArmsUp season will be the SCCA Regional at Blackhawk Farms October 17 - 19. Jim Victor, Revere and John Greist and Rick Balsley are scheduled to compete in the Formula Continental class.